Ashleigh Schaffer graduated with a B.S. 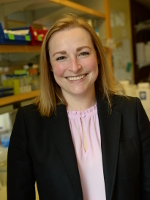 in Genetics from University of Wisconsin-Madison and went on to earn her Ph.D. from the University of California, Irvine under the mentorship of Dr. Maike Sander, where she studied transcription factor-mediated mechanisms of cell fate determination in the pancreas. She then continued her training as a postdoctoral fellow at the University of California, San Diego, and Howard Hughes Medical Institute under the guidance of Dr. Joseph G. Gleeson, focused on elucidating the genetic cause, and molecular mechanisms, underlying recessive pediatric neurological disease. During her time with Dr. Gleeson, Ashleigh discovered over 20 novel genetic causes of disease, many of which occurred in proteins that bind to RNA. She was then awarded an NIH K99/R00 Pathway to Independence grant to delve further into RNA-mediated pediatric neurological disease mechanisms in the lab of Gene Yeo at University of California, San Diego. She joined the Department of Genetics and Genomes Sciences at Case Western Reserve University as an Assistant Professor in February 2017. She has a secondary appointment in the Center for RNA Science and Therapeutics. It has long been assumed that ubiquitously expressed proteins, like those that regulate RNA transcription and translation, function in a conserved manner across tissues and between species. Thus, severe, damaging mutations would lead to systemic phenotypes and cause lethality in humans. Contrary to this idea, we have identified patients with tissue specific disorders harboring variants in a variety of ubiquitously expressed proteins. This finding indicates ubiquitous proteins may function, or regulate, cellular processes in a cell type specific manner. Our laboratory is primarily interested in understanding the unique functions of ubiquitously expressed proteins in human brain development and pediatric neurological disease. We focus on a set of ubiquitously expressed proteins that regulate RNA biogenesis, stability, and protein translation called RNA binding proteins. We use a variety of animal and stem cell models to investigate protein function on a gross and molecular scale. Additionally, we aim to uncover new mechanisms of neurological disease through genetic and functional studies conducted in collaboration with our local hospitals. Biallelic loss of human CTNNA2, encoding αN-catenin, leads to ARP2/3 complex overactivity and disordered cortical neuronal migration. Biallelic mutations in the 3' exonuclease TOE1 cause pontocerebellar hypoplasia and uncover a role in snRNA processing. An AKT3-FOXG1-reelin network underlies defective migration in human focal malformations of cortical development. Biallelic mutations in SNX14 cause a syndromic form of cerebellar atrophy and lysosome-autophagosome dysfunction. CLP1 founder mutation links tRNA splicing and maturation to cerebellar development and neurodegeneration. Novel mutation in the fukutin gene in an Egyptian family with Fukuyama congenital muscular dystrophy and microcephaly. A homozygous IER3IP1 mutation causes microcephaly with simplified gyral pattern, epilepsy, and permanent neonatal diabetes syndrome (MEDS). Exome sequencing can improve diagnosis and alter patient management.